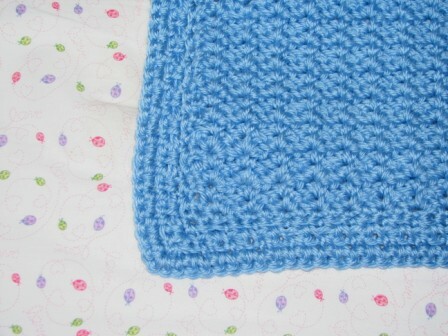 The Quick Blocks baby afghan is made with worsted weight yarn so it works up quickly. Baby Soft Steps yarn is a super soft yarn for that special new little one. Notes: Afghan is made is one piece. Row 1: (sc, ch2, sc) in 2nd ch from hook, * skip next ch, (sc, ch2, sc) 12 times*, sc in next 25 ch, repeat from * to * 13 times, turn. Row 2-26: ch1, (sc, ch2, sc) in next 13 ch2 sps, skip next sc, sc in front loop of next 25 sc, (sc, ch2, sc) in next 13 ch2 sps, turn. Row 28: ch1, sc in front loop of 1st 25 sc, (sc, ch2, sc) in next sc, *skip next sc, (sc, ch2, sc) in next sc* repeat from * to * 12 times, sc in front loops of net 25 sc, turn. Row 29: ch1, sc in front loops of net 25 sc, skip next sc, *(sc, ch2, sc) in next ch2 sp* 13 times, skip next sc, sc in front loop of next 25 sc, turn. Row 30-53: Repeat Row 29. Row 54: ch1, sc in front loop of 1st 25 sc, sc in next ch2 sp, (sc in next sc, sc in next ch2 sp) 12 times, sc in front loop of last 25 sc, turn. Row 55: ch1, (sc, ch2, sc) in 1st sc *skip next sc, (sc, ch2, sc) in next sc* repeat from * to * 12 times, sc in front loop of next 25 sc, (sc, ch2, sc) in next sc *skip next sc, (sc, ch2, sc) in next sc* repeat from * to * 12 times, turn. Row 56: ch1, (sc, ch2, sc) in next 13 ch2 sps, skip next sc, sc in front loop of next 25 sc, (sc, ch2, sc) in next 13 ch2 sps, turn. Row 57-80: Repeat Row 56. Turn but do not fasten off. Round 1: sc in ch2 sp, *sc in next sc, sc in next ch2 sp* 12 times, sc in next 25 sc, repeat from * to *, 3sc in corner, sc down side of afghan, 3sc in corner, 75 sc in bottom of afghan, 3sc in corner, sc up side of afghan, 3sc in corner, slip stitch in 1st sc, turn. Round 2: ch1, 3sc in corner st, ch1, skip next sc, *sc in next sc, ch1, skip next sc across, 3sc in corner st*, repeat from * around, slip stitch in 1sc, turn. Round 3: ch1, *(sc in ch1 sp, ch1), repeat across, 3sc in corner sc*, repeat from * to * around. Fasten off. Tie in ends. I love this pattern, and I bought the yarn to make it the other day. However, I have started this and frogged it 4 times now! Somehow I must be missing something in the instructions for Row 1, because it is not coming out to be the 13 (sc Ch2 sc) stitches on each end (I can get 13 at the beginning but only end up with 10 at the other end. I have no idea what I am doing wrong. Is there any help you can give me?? Thanks so much. I’ll check it today for you. Sorry for the delay. Wow, I love this pattern. So simple and fast to make. Made some for our local Hospital and Baby gifts. Even have use different types of yarn and added more stitches. Comes out so Beautiful. Thank you so much for the feedback! I’m working on some more patterns that would be great for donations. How did you add more stitches. I would like to make the blanket a little bigger but don’t know how many stiches to add. Is there a way to print this pattern out? I am trying to do this a work can not have my laptop open. At the bottom of the pattern/post there is a part that says, “Share & Enjoy.” The third one from the right should be a print button. Let me know if you need more help finding it. This is a very nice pattern for a baby blanket. Would it be all right for me to teach this at one of my crochet classes in the Library. It is a free class, we don’t charge people anything for this, they just bring their own yarn and hook. I’ve been crocheting for years, and years and the Director had asked me to teach a class and I have done so before. So just wanted to ask permission to use your pattern since it is an easy one for beginners and those who have some experience. Yes! Feel free to use my pattern in your group. I appreciate you asking. I would love to see some pics of your blankets when they’re done! I will do that. Most likely I’ll be doing this in January since right now we are doing scarves and cowls. Thank you for your OK. Thank you for your generosity in sharing your idea. Thanks so much for the feedback, Mama Maureen! Would love to see pictures. I have 5 small children at home so I don’t do videos at this time (too much background noise). Sorry. No worries. Completely understandable. Thanks! Thank you so much for beautiful blanket pattern that is simple to create. I love it. I added it to my ravelry queue and will send photos when done. Really enjoy working it up. I have almost completed 1st blocks section last night while listening to tv. Making a blanket for my new grand baby, as well as a few expecting co-workers. I love the ease of blocks wthout having to join them. I will definitely give you credit for any I make! Shouldn’t the starting chain 78 ? If each block is 25 and you start from the 2nd chain from hook? Thank you. I have corrected the pattern. I am a novice crocheter so please forgive any ignorance. I am working on this pattern and my work is uneven, meaning the first and third blocks are bulkier than the middle sc block, so it doesn’t line up straight. I am on about row 5, Before continuing and doing it all wrong the whole time I figured I should ask. Is that normal, does it balance out once you stitch the block pattern? Or am I doing something wrong? Hi Katy, the stitches should even back out when you get to the second set of blocks. How many ounces does each skein of this yarn weigh?! Hi! Will this yarn be enough?